With the Speedy Entry tool , you can enter music in step-time very efficiently, using the synthesizer to specify the pitch of each note and the computer keyboard to specify the duration. Choose the Speedy Entry tool . The Speedy menu appears. Choose Speedy > Use MIDI Device for Input. Click the first measure into which you want to enter music. The Speedy Entry editing frame appears. To enter a note or chord, hold down the desired key (or keys) on the synthesizer and press a number key on the computer keypad corresponding to the desired rhythmic value. If you press a number key without holding down any synthesizer keys, a rest of the specified value appears. If you want to insert a note, chord, or rest before the insertion bar, press SHIFT as you press the number key. Press the period key to dot the note (you can add up to ten dots by repeating this action). To change the rhythmic value of a note or rest, position the insertion bar on it and press the number key corresponding to the desired value. 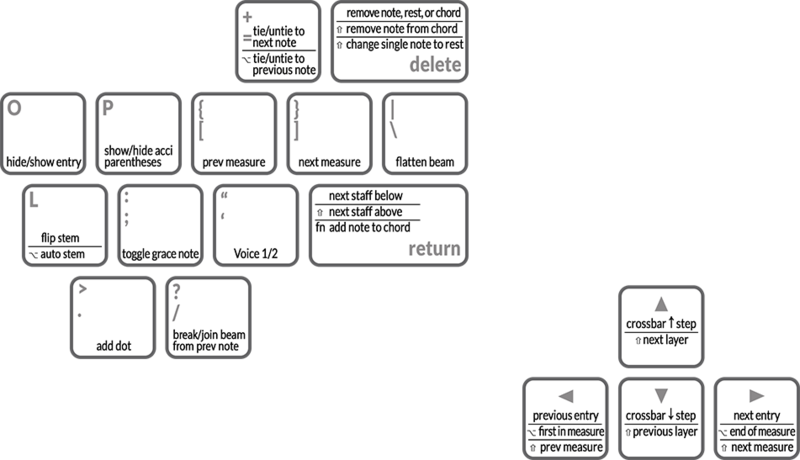 The following diagram shows which keys correspond to which note values. Move the insertion bar either by pressing the right or left arrow keys or by clicking the desired note. If Finale presents the “There are too many beats” dialog box when you change a note’s value, press RETURN to eliminate the dialog box. If you choose Speedy > Jump to Next Measure, so that a check mark no longer appears, this dialog box will only appear when you exit the editing frame of a measure with too many beats. To add a note to a chord, position the crossbar at the desired pitch, and press enter. You can also double-click where you want the new note to appear. To remove a note, chord or rest, position the insertion bar on it and press DELETE. To remove a single note from a chord, position both the insertion bar and the pitch crossbar) on the notehead and press CLEAR. To change a rest to a note, position the insertion bar on it, position the crossbar at the desired pitch, and press enter. This method can also be used to add a note to an existing chord. You can change a single note (not a chord) to a rest by pressing CLEAR or SHIFT+DELETE. To change a note to a different note or chord without changing the duration, position the crossbar on the note, hold down the desired note or chord on the MIDI keyboard, and press enter. To move a note or rest horizontally, drag it to the left or right. Press SHIFT as you drag to prevent you from accidentally dragging the note or rest up or down. To move a rest vertically, drag it up or down. To move a note vertically, drag it up or down. Press SHIFT as you drag to prevent you from accidentally dragging the note or rest horizontally. If you want to move a whole chord up or down, double-click it; on the second click, keep the mouse button pressed and drag up or down. To hide a note or rest, position the insertion bar on it and press the letter O or H key. Press the O key again to display the note or rest again. See also Notes and Rests (Hide) Plug-in, Notes and Rests (Show) Plug-in. To flip a stem, press the L key. This process freezes the stem up or down, so that it’s no longer free to flip if, for example, it gets transposed. To restore the note to its “flippable” status, press OPTION+L. To raise a note by half steps, position both the insertion bar and the crossbar on it and press the plus (+) key. The minus (–) key lowers the note by half steps; both keys only apply accidentals to an existing note, and won’t actually move the note higher or lower on the staff. You can add up to seven sharps or flats to a note. Press OPTION+plus or minus, to apply the accidental through the rest of the measure. Use S to add a sharp, F for a flat and N for a natural. To change a note to its enharmonic equivalent, position both the insertion bar and the crossbar on it and press the 9 key. With the insertion bar on a note, press OPTION+9, to change the spelling of a note through the rest of the measure. If the pitch crossbar isn’t squarely on a notehead, Finale changes the “spelling” of all notes in the chord each time you press 9. To hide an accidental, position both the insertion bar and the crossbar on it and press the asterisk (*) key. If no accidental is displayed, the asterisk key forces a courtesy accidental to appear; for parentheses, press the P key. If you’ve hidden an accidental, press the asterisk key again to display it again. To create or break a beam, position the insertion bar on the second note of the pair and press the slash (/) or B key. If the notes were flagged separately, they’re now beamed; if they were beamed, the beam is broken (and the notes are individually flagged, if they’re not beamed to any other notes). Use SHIFT+B to restore the beaming to the defaults found in Document Options - Beams. To flatten a beam, position the insertion bar in the beam group and press the backslash (\) or M key. If the beam was already flattened in Speedy Entry the beam will now return to the default angle. See Flat Beams Plug-in, Flat Beams (Remove) Plug-in. To tie notes, position the insertion bar on the first note and press = or T. To tie the previous notes, press OPTION+= or SHIFT+T. To add a dot to a note, position the insertion bar on the note and press . (period). To switch layers (from Layer 1 to Layer 2, for example), press SHIFT+UP ARROW or SHIFT+DOWN ARROW. To switch voices (from Voice 1 to Voice 2, for example), press the apostrophe key alone. For a more complete discussion of multiple voice mechanisms, see Multiple voices. To advance to the next measure, press the right bracket (]) key. Pressing the left bracket ([) key moves the editing frame to the previous measure. Press RETURN to move down a staff, or SHIFT+RETURN to move up a staff. Choose the Speedy Entry tool , and click a measure. The editing frame appears. Press caps lock; then press the number key on the computer keyboard corresponding to the value you want to enter. In other words, you’re now telling Finale what the note values are going to be before you specify the pitches. Use OPTION+number to enter a series of tuplets. The number you press appears in the lower-left corner of the editing frame. The tuplet number, if any, appears in the top-right corner of the editing frame. Play the notes on your MIDI keyboard. Each note you play appears in the score; if Jump to Next Measure is checked in the Speedy menu, the editing frame advances automatically as soon as you fill each measure. It’s safe to outplay Finale, too; it will remember up to 500 notes (and continue to notate them as fast as your computer allows). To enter rests, play a three-note cluster, in other words, three notes each a half-step apart. You can also use the Speedy Entry tool to enter music in step-time without using a MIDI device. Use the number keys on your keypad to specify the durations of notes, just as you normally do. But to specify the pitches, you can use the arrow keys or the alphabet keys to move the pitch crossbar instead of using the MIDI device. With practice, this method of “typing in the music” can become extremely quick and precise. Choose Speedy > Use MIDI Device for Input and make sure it is unchecked. 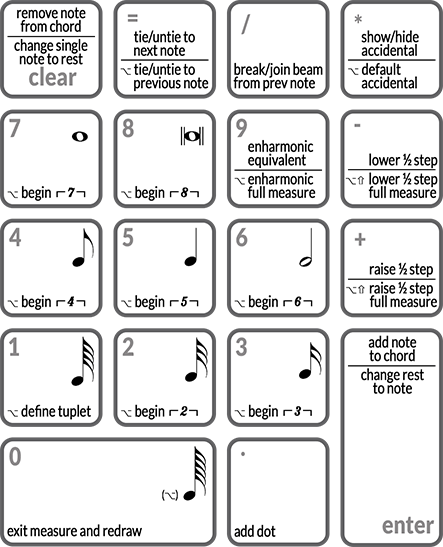 Click the first measure in which notes are to appear. The editing frame appears. Use the arrow keys to place the cursor on the desired pitch. Press a number key (corresponding to a rhythmic value) to create a note. Hold down OPTION, SHIFT, and a number key to create a rest. You can also use the method below to specify the pitch. If you want to access a lower register, press the letter I key, which shifts the entire alpha-key pitch mapping down an octave. Press the comma (,) key to shift the entire keyboard up an octave. In either case, you can restore the alphabet keys to their original octave by pressing the K key. To help you remember, think of it this way: press a key (I, K, or comma) to designate the row of letter keys you want to contain middle C.
For a diagram showing the assignment of rhythmic values to the number keys, see To enter music in step time using MIDI, above. Position the cursor on the entry before which you want the note inserted. Choose Speedy > Insert Notes or Rests. Press the number representing the note duration you are inserting. If you are holding down a key on your MIDI device, you will insert a note. Otherwise, you will insert a rest. For non-MIDI, press a number to insert a note, or OPTION+SHIFT and a number to insert a rest.